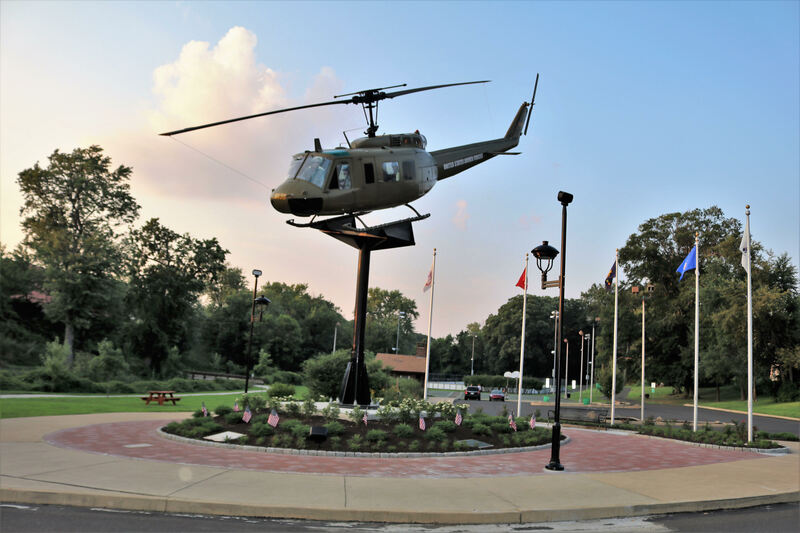 Willow Grove, PA…For the last 14 years, everyone saw the gradual transformation of Willow Grove’s Veterans Memorial Park. Ralph Storti saw the future site of remarkable monument honoring those who have served in the military. Fourteen years later, on July 12, 2018, his vision became a reality and the monument finally took its place in the sky. Inside the helicopter are life-size photos of the committee members who made it their mission to see it hover above the park just like Storti dreamed. To create a 3D effect, there are photos of the pilot and co-pilot’s front and side profiles. Dressed in flak jackets and helmets, they look like a real helicopter crew. In the co-pilot seat there’s Upper Moreland Township Commissioner Kip McFatridge. Sitting behind him is Caroline Young, of Youngscape Landscaping. To her left is Bob Mathers, of RHM Real Estate. In the pilot seat is Storti, who presided over the committee and willed his idea of the helicopter as a monument into reality. The park’s nine acres were first purchased by neighboring residents shortly after World War II. Their dream was to create a park to honor veterans. Lacking the resources to develop the ground, the organization in charge of the property gave control of it to Upper Moreland Township to create War Memorial Park, which later became Veterans Memorial Park. When Storti joined the board, there was an effort underway to revitalize the park. His initial suggestion of a helicopter was much simpler in the beginning. Obtaining the helicopter for free was easier said than done. Veteran’s organizations can request them for free but they’re put on a waiting list. Storti said he was eighth on the list in 2004 and it took eight years for his number to be called. 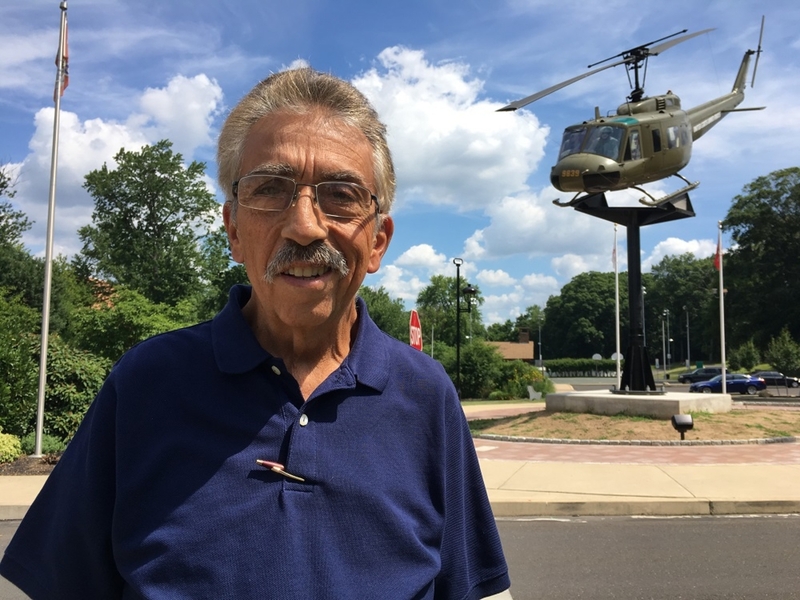 A helicopter flown during the Vietnam War was identified in the Niagara Falls Aerospace Museum. A team from O’Rourke and Sons structural steel business drove up to get it and bring it back down to store in their shop for two years. It was missing parts and needed a lot of work in order to be put back together. Eventually it was moved to the Youngscape Landscaping facility, where it was painted and made ready to be installed at the site. After 14 years of waiting, the site was ready for a crew to begin the six hour job on installing the chopper in its new home. Storti gave a special thanks to State Sen. Stewart Greenleaf, State Rep. Tom Murt, McCloskey and Faber Landscape Architecture, design engineer Joe Cooke, Upper Moreland Township Commissioners, Code Enforcement and Parks and Recreation departments; Youngscape Contracting, McFatridge Welding and Storti Quality; as well as developer Bruce Goodman, Scott Contractors, J.G. Petrucci Company and O’Rourke and Sons for their help in bringing the helicopter idea to reality. The Willow Grove Veterans Memorial Park site still needs to add the flags of the military branches, along with some other finishing touches before its official opening ceremony later this fall but visitors have already begun trickling in to look at the new monument. In the meantime, Storti hopes those who now come to admire the new addition to the park will never forget the reason why it’s there in the first place — to honor the sacrifices of America’s veterans.